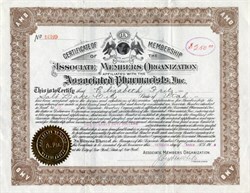 Beautiful certificate from the Associated Members Organization affiliated with the Associated Pharmacists, Inc. issued in 1918. This historic document has an ornate border around it with a vignette of the organization logo. This item has the original signature of Organization's Treasurer and is over 94 years old. 29993. (Buffalo, N. Y.) 1 wish you would give me what information you can regarding - th,o eapitp.lization, management and present operation of what is known as the Associated Pharmacists, Inc. Also please let me know what is being done by tho Simplex Air Brake & Manufacturing Co. of Pittsburgh, Pa., are they still in business, and what do you think of the value of their stock? Ans. : The plan under which the Associated Pharmacists, Inc., operates was first tried out on the Pacific Coast. Just what success was attained there we have been unable to ascertain. It was decided to come to New York to be nearer the source of raw materials and thereby save the long freight haul across the country. The plan of the company is to manufacture goods handled by druggists in concentrate form which it is claimed saves freight charges often paid on a large volume of water and the like. The company lias a factory in Brooklyn, N. Y. where it also maintains its headquarters. The organization is a rather complicated one. There is an association for druggists and an association for consumers. By bringing the druggist and the consumer into one organization it is believed that the druggist will push the Associated Pharmacists' goods in preference to others and that consumer members will express a preference in buying. "the idea is a reasonable one, it would seem, the goods being put up in distinctive packages anil marked but we have never been able to get a financial statement that would give some idea of just what the company is doing. Consumers who are members are used to interest others to become members. Membership campaigns have been conducted in several Kastern states. In the absence cf anything to show Just what the company is doing we have refused to recommend the proposition.